On the month, the S&P lost 0.19%, while the Russell 2000 shed a modest 0.22%. On the surface, February appears to be an uneventful market month. In reality, the month was a tale of two halves. At one point, the S&P was down 6.52% intraday, while the Russell was down 9.05%. Throughout, the market’s correlation with oil (highlighted in our January commentary) continued. In essence, the market lends itself to the conclusion that it bottomed because oil did. This relationship is neither actionable nor enduring. We remain resolute in our conviction that markets are being driven by liquidity needs of sovereign wealth funds in oil-rich nations (or shall we say oil poor these days?) and the portfolio effect of large investors whose portfolios became too tied to the energy sector. “in 1950, the average holding [period] for a stock in a mutual fund portfolio was 5.9 years; in 2011, it was barely one year.” As of 2011, annual turnover of U.S. stocks was over 250% per year! There are robust performance, behavioral and tax reasons to keep turnover low and believe this is a core tenet of quality long-term investment. Given the relationship between the yield curve and forward expectations of inflation, one would expect inflation to be falling alongside, or shortly thereafter a flattening of the yield curve. We went through the case for rising inflation in our 2016 Preview, premised on a tightening labor supply, a tightening housing supply, and increasing flexibility for discretionary spending on account of the oil dividend. 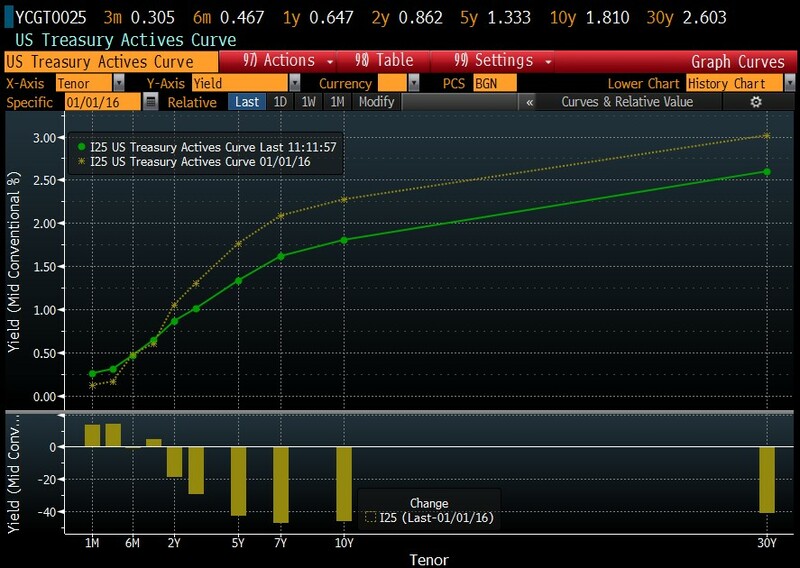 That case has only strengthened so far this year on all fronts, despite what the yield curve is telling us. We caveat that this reemergence of inflation is healthy. It is not an event to be feared. Instead inflation reflects the normalization of our economy after a period of tumult. The Fed has ample tools at its disposal to keep inflation from getting to the point where it would be a concern. Traders are being tricked by oil. This happened when oil was rising in years past too; with Jean Claude Trichet, the former ECB President “falling for it.” As Matt Busigin explains so nicely in a piece entitled, “only Bernanke knew oil is not inflation.” In reality, the fall in oil will ultimately be inflationary as consumers start spending their savings on discretionary items. This is a contrarian view today; however, we expect time to prove us right. We simply have to wait out the time lag between the short term pain and the long-term gain. Negative Interest Rate Policy (NIRP) around the world. When Japan shocked the world and joined Europe in adopting NIRP, a wave of slippery slope thinking took hold of the financial world. Traders started speculating about which country would be next, and how long it would be before NIRP came to the US. Additionally, global investors and institutions who need to find yield were likely to find the US increasingly attractive on a relative basis, leading to further flows (and thus downward pressure) on the yield curve here. With the aforementioned inflation backdrop, any conversation about NIRP in the US is misguided. In the 1960s, some old-timers on Wall Street—the men who remembered the trauma of the 1929 Crash and the Great Depression—gave me a warning: “When we fade from this business, something will be lost. That is the memory of 1929.” Because of that personal recollection, they said, they acted with more caution than they otherwise might. Collectively, their generation provided an in-built brake on the wildest forms of speculation, an insurance policy against financial excess and consequent catastrophe. Their memories provided a practical form of long-term dependence in the financial markets. Is it any wonder that in 1987, when most of those men were gone and their wisdom forgotten, the market encountered its first crash in nearly sixty years? The safest time to fly is in the days following a plane crash. Everyone involved in the safety processes, from the ground crew to the pilots are on heightened alert in an effort to avoid any further mishaps. In markets and economies, this is no different. Finance is far healthier in the aftermath of a crash, because the excesses have been wrung from the system and the actors have been humbled. For those who recently saw The Big Short, you would have been reminded about how few people in position to do so actually saw a crash coming. In fact, those who warned about a crash were all outsiders, viewed with a degree of scorn by the mainstream in finance. Now, hardly a day goes by without another publication referencing the potential for “another 2008.” The fresh wounds from 2008 are exactly the kind of collective market memory for preventing another 2008 from happening. This does not mean we won’t have more recessions and bear markets—we will—however, it does mean that they will be different and that the consequences for the economy will be far less ominous. The fact is: unless we live a very long time (which hopefully we all will! ), we will only experience a “once-in-a-lifetime” crisis once in our life—2008s. Mandelbrot, Benoit. The Misbehavior of Markets: A Fractal View of Financial Turbulence. Location 2676. This entry was posted in 2016, Commentary on March 10, 2016 by RGAIA.